In case you haven’t noticed, it’s asparagus season!! If you’ve hit up any farmer’s markets lately, it is basically the most abundant veggie available. I never used to like asparagus, as I have childhood memories of it being raaaather overcooked (sorry Ma). BUT, then I discovered the wonder of BBQ’d asparagus and it’s now become a staple in my summer recipe repertoire. BBQing isn’t always nutritionist approved, as a lot of the time it involves bad oils and the not so healthy meats, among other things. I realize you aren’t going to give up BBQing, so this recipe uses heat stable oils and is veggie based, so you don’t have to feel guilty! 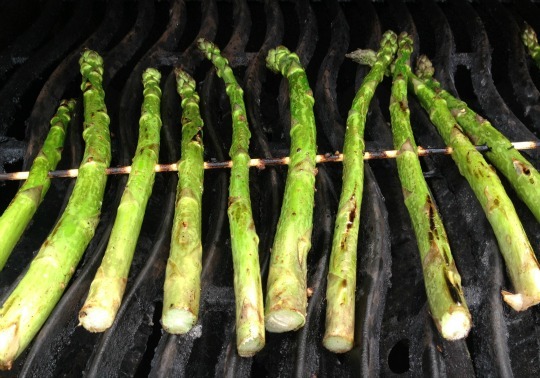 AND, the best part of this recipe is that the asparagus will not fall through the grates of the BBQ, because it’s on a skewer. A skewer is also a really fun way to serve it! You can feel good about eating asparagus as it is an excellent source of folic acid, a B vitamin that is important for cell formation and circulation support. Serve either on or off the skewers.